As described in my previous blog post Hidradenitis of the Armpits – Boils Under the Armpits a plug of dead skin in the duct of a gland emptying into a hair follicle in areas of opposing skin surfaces like the armpits, under the breasts and in the groin initiates an infectious process as bacteria multiply within the plugged gland creating a skin boil. The obstructed gland or boil ruptures into the deep layers of the skin; adjacent glands become involved; and abscesses form. Subsequently, multiple draining sinuses or holes appear on the skin surface and the whole hair bearing area may become inflamed. We call this process #HidradenitisSuppuritiva (HS). As I described my first choice of treatment for this process is surgical removal of the involved skin and closure of the resulting wound with a flap of adjacent normal skin. However, this aggressive surgery is not always the best near term option because of insurance, financial, work or personal reasons. For early stages of the disease temporizing the situation with topical treatments is appropriate and can provide significant relief. We now know that there is an inflammatory process present in hidradenitis before there is any sign of infection such as an abscess and I call that pre-stage I. In that stage the skin is intact with redness, tenderness, warmth and burning pains just before an abscess appears. In this early stage there is no drainage and a raised swelling may form a nodule which is very different from an abscess. Some doctors prefer antibiotics and injections of corticosteroids into the affected areas to treat early Stage 1 disease. Others give larger doses of steroids by mouth or testosterone antagonists. Stage III is not amenable to these temporizing measures because of the degree and depth of skin damage but these measures can delay disease progression when employed early in stage I. Staging of the disease and its appropriate treatment is complicated by a tendency of the disease to go through quiescent and active phases. The person afflicted with HS applies a medication, swallows a pill or changes their diet in some way at a time when the process is about to go quiescent and then mistakenly attributes the quiescence to the medication, pill etc. The treatments described here have been vigorously studied by numerous groups on a variety of wounds including HS. They are employed at assisted living facilities and nursing homes across the country each day. The topical treatments can be divided into types of dressings and medications either applied directly to a wound or impregnated into the dressing. 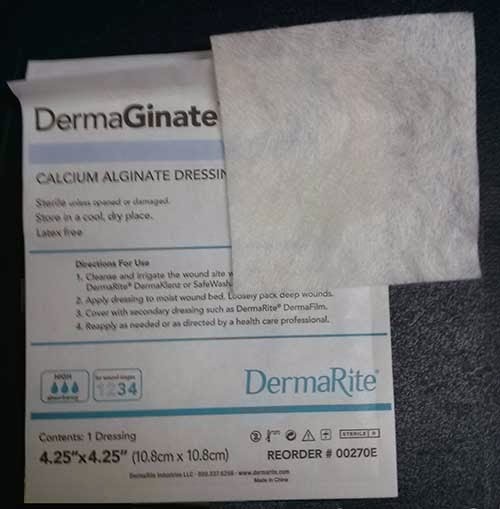 A dressing is something such as gauze that is applied directly to a wound to promote healing, stem bleeding, absorb wound drainage, remove dead surface tissue, prevent medications applied to the wound surface from evaporating or falling off and protect from or treat infection. In medieval times they were applied mostly to prevent others from seeing ones wounds. Historical belief that a wound should be kept dry in order to heal faster without infection were dispelled in the 1960s when studies showed that wound surface cells died when they were allowed to dry out thereby prolonging the time required for healing. In the last 20 to 30 years a vast number of different types of dressings with different properties or functions have been introduced . 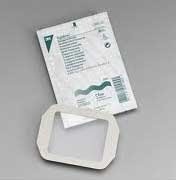 prevent leakage from a wound and keep the wound surface moist while preventing outside moisture from reaching the wound. They look like thin pieces of pliable plastic that come in a variety of thicknesses and shapes and stick directly to the skin around a wound. 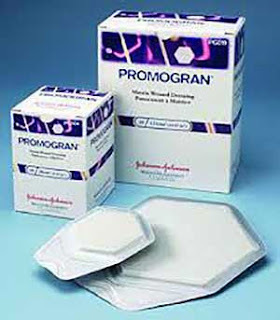 The most common brand used is Duoderm. are waterproof keeping outside moisture and bacteria away from a wound while keeping the wound moist and easy to evaluate as you can see through them. The most common brand used is Tagaderm. Once you have picked a dressing the next choice is whether or not to apply medication on the wound and under the dressing or impregnated into the dressing. Dressings impregnated with medications from the manufacturer can be very expensive in which case you can save significant money by applying the medication to the dressing rubbing it over the surface of the wound and then taping the dressing in position. Unfortunately that is not possible with silver. In 1983 a double blind study found that topical clindamycin antibiotic performed better than a placebo in diminishing abscesses, inflammatory nodules and pustules of hidradenitis in the first month of treatment with less of a difference between the 2 groups after 2 and 3 months of treatment. No side effects were recorded and the treatment was easy to administer. Topical clindamycin is best used in preparing patients for surgery so there is less chance of a complication after surgery. is an antiseptic and disinfectant that is the active ingredient in over the counter acne medications like Clearasil. In a 2010 study, topical treatment with 15% resorcinol reduced pain from painful nodules in all patients with hidradenitis suppurativa. The medication cannot be used over areas that have lost skin integrity because it can be absorbed into the circulation and cause a blood disease called methemoglobinemia (resorcinol poisoning). Drainage is a sign of lost skin integrity and therefore precludes the use of resorcinol. 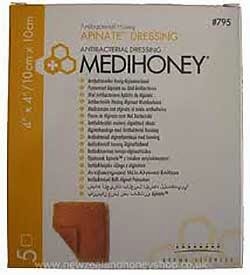 References and formulas for honey-based wound dressings can be found throughout the medical writings of ancient Egypt, Greece, Rome, India, and China. Honey was used as a first line treatment until the mid-twentieth century when synthetic dressing materials and antiseptics grew in popularity at the expense of natural wound care treatments. Regulatory reforms of the 1970s established high standards for sterility, consistency, and quality control of medical products that created new challenges for natural products in the medical marketplace, and honey was largely forgotten as a wound treatment by modern clinicians – until now! Multiple studies going back to 2004 show antimicrobial, anti-inlfammatory and wound healing enhancement properties of honey. More recent studies have shown that the addition of wound honey to topical antibiotics improves their effectiveness. This is not your usual cooking or table honey that you put on pancakes. Medihoney and manuka honey are the main wound honeys. They are bitter and not fit for consumption as a food item. Walgreens and CVS sell antibacterial bandaids that contain the antiseptic Benzalkonium Chloride 0.1%. This antiseptic is commonly found in contact lens solutions, nasal sprays and mouthwash and is prescribed by dermatologists for acne. 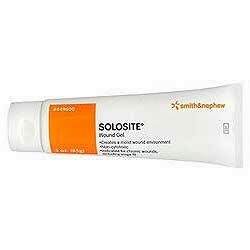 It has not been as well studied as 15% resorcinol but certainly is a cost effective first choice if you catch a bout of HS early and is not associated with a risk of methemoglobinemia . A box of 10 at CVS is less than $4. Presence of infection as evidence by bad odor, pus, pain, and/or warm red surrounding skin. Before employing any of these medications or dressings you should be cleared by your personal physician and have your ongoing care including frequency of dressing changes and bath soaks supervised by them to avoid sensitivity or allergic reactions that can present immediately or after multiple applications of an initially well tolerated product. 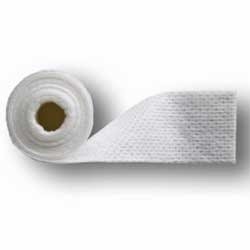 Even the adhesive in a bandage or on a tape can be problematic. Obviously if you are allergic to bee stings or honey medihoney is not a viable option. If you are pre-stage I resorcinol or medihoney under a transparent dressing is a good option as they will reduce the inflammation while allowing you to directly observe the area for disease progression. 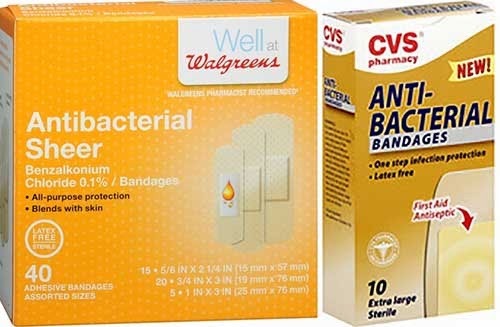 If you are stage I with visible abscess infections but no drainage clindamycin ointment and/or medihoney under a transparent dressing is a good option. This should treat the infection while allowing direct observation of the area. The ointment cannot be used for prolonged periods because you will end up with resistant bacteria. Once you start having drainage alginate or foam dressings are better options to soak up this drainage. Foam is better when the wounds have depth to them as foam is thicker than alginate allowing more wound packing with less dressing. Either one can be obtained with silver or medihoney impregnated to fight the infection at the same time as the drainage is collected. They come in sizes as large as 6x6cm. The impregnated forms are quite expensive while tubes of medihoney can bought on Amazon for $15 a tube and applied to the cheaper non-impregnated forms prior to application. As the disease process subsides you can move on to mesalt dressings and if there are open areas without drainage hydrocolloid dressings are very good options. 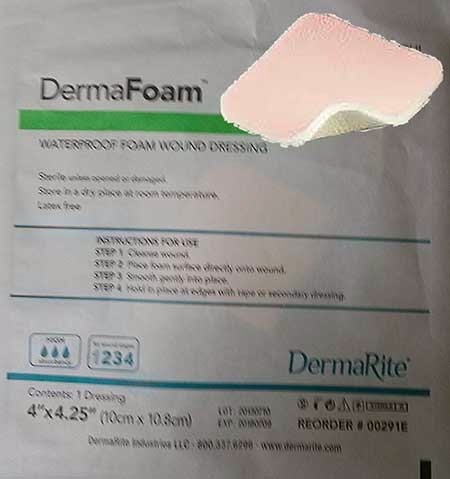 Hydrocolloid dressings applied to raw areas after surgical excision of hidradenitis have been proven to minimize discomfort, allow faster mobilization, remain dryer longer and reduce nursing time compared to conventional gauze dressings. One of my patients had a raw spot on each buttock after surgery whose edges would stick together when sleeping and tear apart when sitting or walking. The areas could therefore not heal. Application of Duoderm to each spot stopped them from sticking together at night and they healed over. Taping dressings in place can be problematic if the drainage has an odor or large volume as the frequent dressing changes, removing the tape each time, chafes the surrounding skin. These are 2 good options to keep the dressings in place. You can create shorts made of tubular elastic to hold dressings on the groin or buttocks. 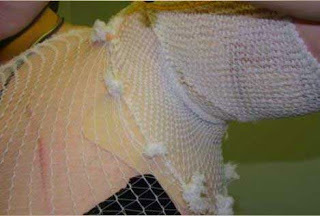 The outer white parts of Montgomery Straps stick to the skin on either side of the wound and laces are threaded between the holes to keep a dressing on/in a wound. You untie and tie the laces to change the dressing that way you don’t have to keep ripping tape off of your skin. This is especially good for wounds that drain a lot of fluid. You can put an alginate in there and hold it in place with the laces. The alginate will soak up the drainage like a sponge. You can even change the dressing 3 or 4 times a day if you need to. 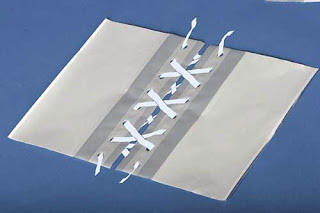 You can make your own by using 3 inch wide medical tape and folding the adhesive side onto itself along one edge. Punch holes in the double thickness portion of the tape to thread laces through and you have made your own montgomery strap.